Jim Carrey is one of Hollywood’s biggest movie stars of the 1990s. His collection of hits reveals a rare comic talent; an actor with the range to move from manic over-energised man-child to subtle, tragic, lost soul. 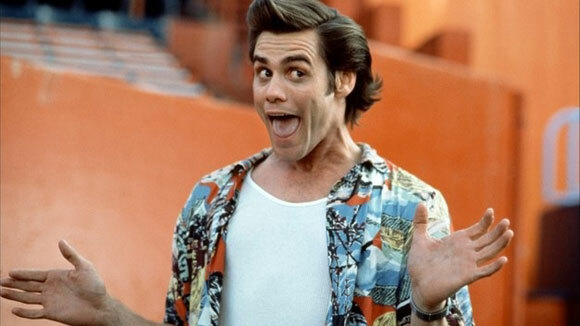 It would be easy to assume the career of Jim Carrey began with Ace Ventura: Pet Detective in 1994. That was the film that launched his Hollywood career and led to the Ontario-born actor becoming one of the 1990s biggest movie stars. 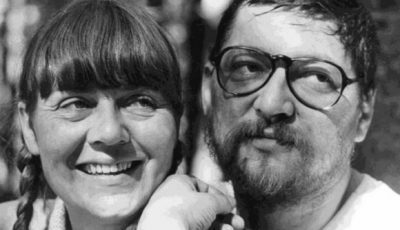 But his work in film began over a decade earlier (his first credit sees him appear in a raunchy 1983 comedy). He then starred in Once Bitten in 1985 and had roles in Peggy Sue Got Married and Earth Girls Are Easy. 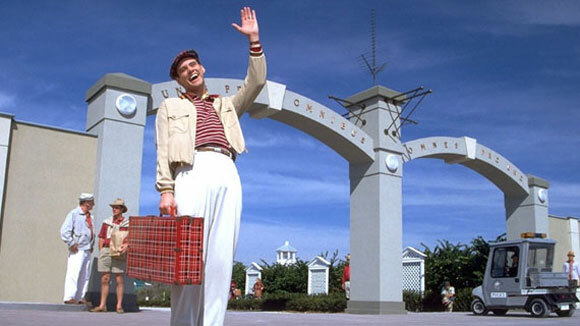 Carrey made a name for himself on the comedy circuit and worked in TV during the late 1980s and early 1990s. However, he set his heart on film. He famously tells a story about his affection for the law of attraction (the belief that by focusing on positive thoughts a person brings those experiences into their life). He frequently visualised a cheque for $10 million in his pocket, believing that such a technique would make the dream a reality. Seven years after beginning this exercise he achieved that milestone, receiving a $10 million contract for his work in Dumb and Dumber. This huge box office flop ended Jim Carrey’s golden period which featured near-uninterrupted decade long success. Although he’d turn it around two years later with smash hit Bruce Almighty, this is a far more interesting film. Perhaps audiences weren’t ready for Carrey’s quieter side, the period setting, or director Frank Darabont’s sedate pacing after the high concept laugh-a-minute thrills of The Grinch and Me, Myself and Irene. Indeed, the film isn’t perfect but the story, about a blacklisted Hollywood writer in 1951 who’s involved in a car accident and loses his memory, offers a satisfying change of direction from the likes of his in-your-face comedy outings. 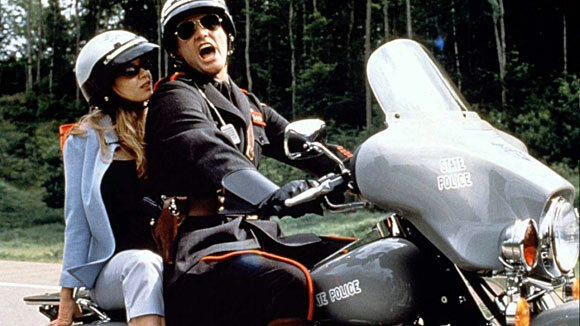 A cash-in comedy to capture the mid-1990s popularity of Carrey, this $45 million film did exactly what it needed to for studio Universal. It made over $302m at the box office, further highlighting Carrey’s star power. It also sees the actor work with director Tom Shadyac again after the huge success of their previous film Ace Ventura: Pet Detective. It’s an enjoyable high concept comedy about an egotistical lawyer (played by Carrey) whose endless stream of lies have helped him rise up the ranks of his profession but alienate his family. When his son makes a birthday wish for his father to stop lying, it comes true. This leads to some amusing comic moments. The film that kick-started Jim Carrey’s career. It set the actor on course to becoming one of Hollywood’s highest paid actors of the 1990s and the decade’s biggest box office attraction. Carrey’s manic, childlike eccentricities made him well-suited to the character of pet detective Ace Ventura. Crucially, audiences loved it. 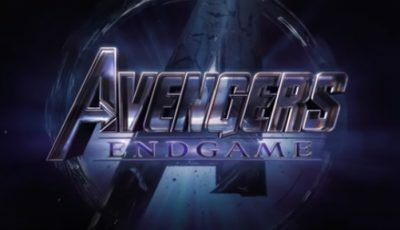 The film, made for $12m, earned nearly ten times that at the box office as audiences warmed for the first time to an actor who had started but failed to make a name for himself in the 1980s. 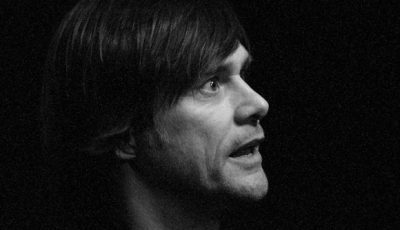 Jim Carrey has worked with directors multiple times, rekindling the commercial success of previous efforts. He reteamed with Tom Shadyac for Liar, Liar after Ace Ventura and in Me, Myself and Irene, he iss back with the Farrelly brothers after delighting audiences with Dumb and Dumber. It’s another high concept comedy, this time Carrey’s character has a split personality he can’t control. It allows the comedian to flex his comedic muscles in a variety of hilarious situations. Renee Zellweger is an ideal foil for Carrey’s histrionics. A darker comedy than the other films Carrey was making in the mid-1990s, director Ben Stiller’s The Cable Guy earned its money back at the box office but audiences weren’t too sure what to make of it. It has its flaws but features a stellar performance from Carrey as a crazy cable service technician. There’s a tragedy in Carrey’s best performances that is often overlooked and here, in 1996, is when we see it for the first time. Ron Howard’s classic Christmas tale is memorable because of a couple of things. Firstly, the production design is truly wonderful, the realisation of Whoville has a toy shop quality to it, a sort of artificiality that begs to be played with like kids’ action figures in a miniature playset. Secondly, there’s Jim Carrey. While almost unrecognisable inside the Grinch make-up, his larger-than-life delivery reminds us exactly who is behind the mask. A perfect comic-tragic character for Carrey to play, the film would be half as good without him. 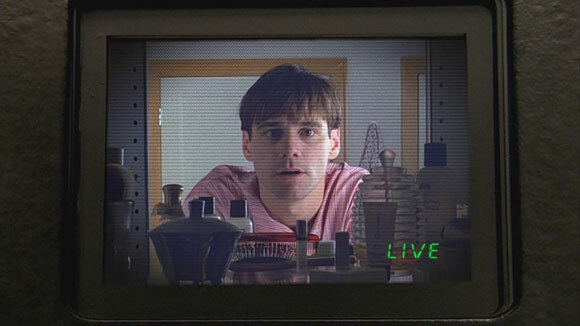 The Truman Show turned heads. 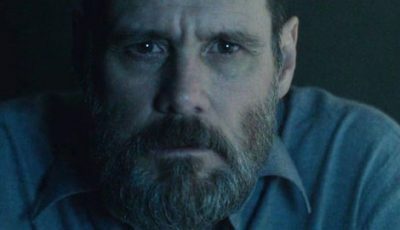 After a number of manic man-child roles, Carrey finally showed another side to his acting talent. Peter Weir’s film requires Carrey to dilute some of his eccentricities without affecting his glowing charisma. The best comedy is often tragic in nature. Carrey understands this. That wonderful combination comes through his character – a man unwittingly trapped inside a TV show where everyone he knows is actually an actor – making for one of his most powerful performances. He’s funny here but he’s also fragile, bitter, angry, lusting and in love. It’s authentic and affecting. 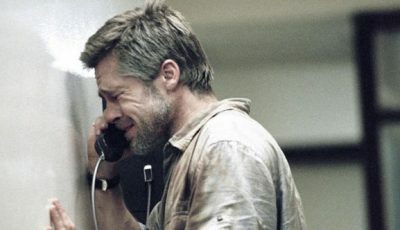 It’s also played out in a unique satire, a film with striking, even frightening foresight. 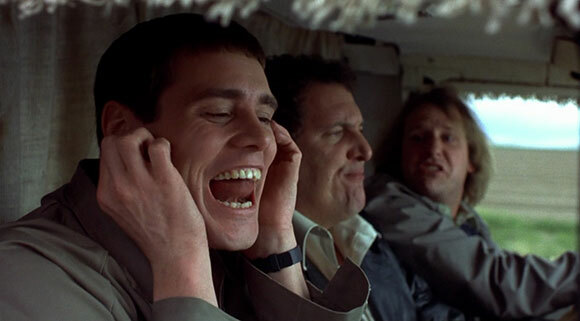 Dumb and Dumber was the film that made Jim Carrey one of Hollywood’s biggest movie stars. He’s brilliant as the man-who-never-grew up Lloyd Christmas alongside an equally impressive Jeff Daniels as his similarly idiotic best friend. Farrelly Brothers humour may have worn thin towards the end of the decade but they were still enjoying their heyday in 1994 and with Carrey they make arguably their best film. 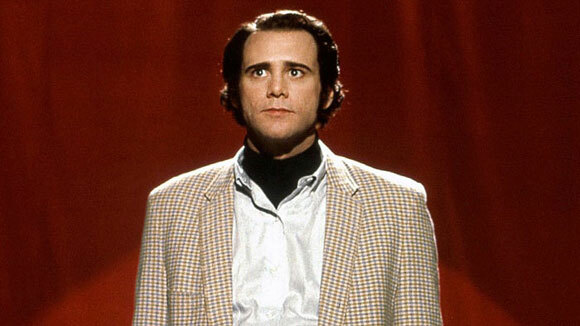 Arguably Carrey’s best performance, his astonishing recreation of the late, quirky, idiosyncratic comic Andy Kaufmann is spot on. 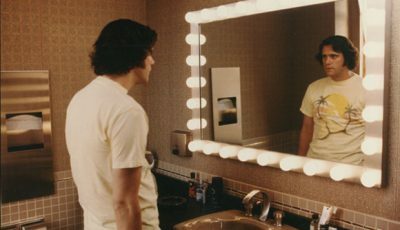 The actor’s appreciation of Kaufmann’s often absurd stage and screen performances is clearly the inspiration behind Carrey’s faultless attention to detail. 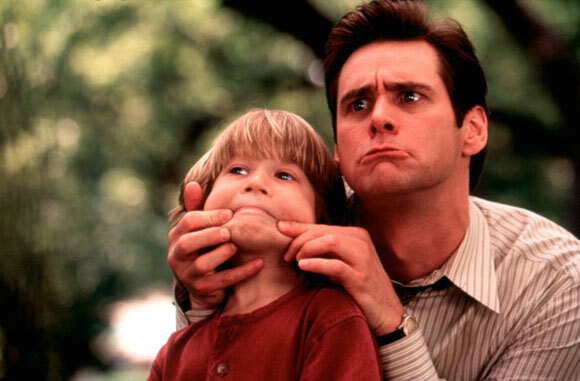 After 1999, no one could deny Carrey’s talent as a film actor, his over-energised, manic man-child finding kinship with Kaufmann as well as an emotional resonance only hinted at previously. A crushingly tragic performance underpins the subtle flavours of offbeat sci-fi, romance and comedy as only writer Charlie Kaufmann can concoct. Carrey’s usual exuberance is toned down, his aching heart laid bare. Eternal Sunshine of the Spotless Mind is at once raw, heartbreaking and uniquely funny. 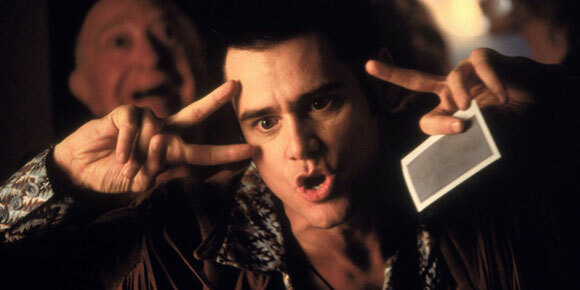 Over to you: what are your fave Jim Carrey films? How would you rank his stop 10? Ace Ventura’s gotta be higher man!!!! Spot on. Eternal Sunshine is the best film, Moon is best performance. Hard to disagree with any of these choices. 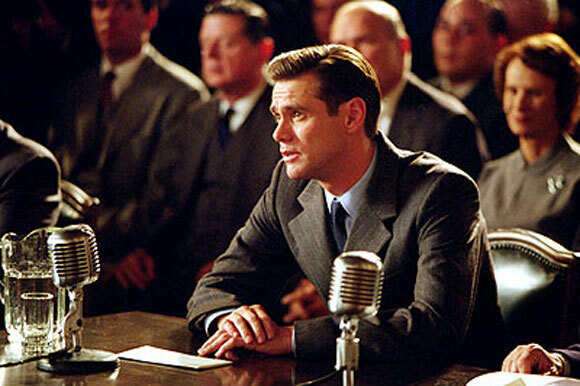 Carrey is a wonderful actor that should have gotten more oscar attention. He is so much better than people make him out to be and so much more as well. If I could maybe add one to this list, I’d take out Cable Guy and add Batman Forever. I thought he was terrific as the Riddler in that one. But I love this list and I’m glad you got around to doing one for Carrey. Agreed. 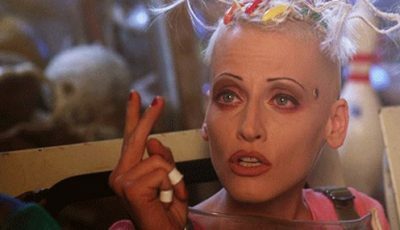 Carrey’s work in Batman Forever is great but I really dislike the film. Ive always thought he was better than some gave him credit for. He’s Oscar worthy and should have got the attention he deserved for Man on the Moon. I thought he was good in Burt Wonderstone too but not sure how you’d get that in the top 10. Never really liked the guy’s broad comedy but Eternal Sunshine, Moon and Truman are exceptional. He definitely has more range that some of his contemporaries in the “comic actor” arena. Those you mention highlight his ability to tone down the histrionics. 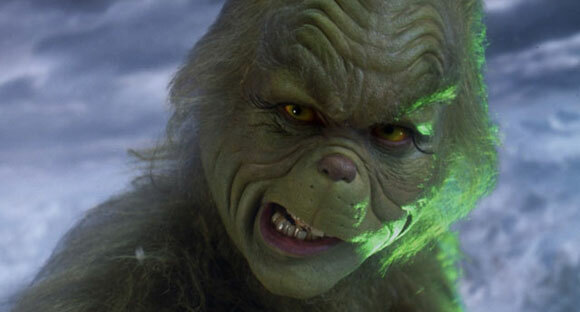 Take Carrey out of The Grinch and then consider what movie you have. Carrey’s energy makes that film and, for that reason, it’s one of his best. I like the top 5 but would probably put Ace Ventura in it over The Grinch. Am I the only one who enjoyed Yes Man? I think you’re in the minority when it comes to liking Yes Man. But Zooey Deschanel is in it and she’s always a delight. 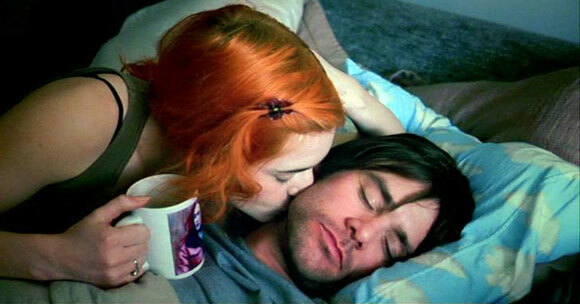 He’s great in all kinds of roles but Eternal Sunshine Of The Spotless Mind is definitely his best. I like Ace Ventura 2 and Bruce Almighty too. Not a fan of Ace Ventura 2. Think the character had run its course after the first one. But Bruce Almighty is fun even if I don’t think of it as one of his best. I can’t deny, I do love Dumb and Dumber. A ha… an actor with an abundance of talent and bad movies…. he’s done 3 good ones… you’ve picked them all… rejoice! I’d say his body of work suggests an comic actor with a lot of range even if some of his films turn sections of the audience away. I’d guess there are as many people saying Ace Ventura, Dumb and Dumber and The Mask were the pinnacle of his career and Eternal, Man On The Moon and The Truman Show are bottom of the heap. Always enjoyed his films. He sort of matured as I grew up. Started with The Mask, Ace and Dumb and Dumber and then went on to Truman and Man On The Moon. He’s fizzled away a bit now though but that Jim and Andy doc was brilliant. You can’t include The Grinch and say his performance elevated the whole movie and then not include The Dead Pool! Also, I Love You Phillip Morris belongs at number 3. But I can include The Grinch if I liked it more than The Dead Pool. And because Carrey absolutely owns that one. Good addition though. Phillip Morris did crop up in my decision making.